I recently was asked by my husband to create something that he could gift to members of his team at work. After some thought and consideration, I decided to go with a gift basket, but using a bucket instead, thinking this was a more "manly" choice. I dipped pretzel rods in milk chocolate and added a variety of toppings (nuts, white chocolate chips, coconut, white chocolate drizzle, etc). I then made home made caramel popcorn and sealed that first in plastic bags which were then placed into burlap bags I had sewn together and tied shut with a fabric remnant. The biggest and most time consuming undertaking was the homemade caramels dipped in chocolate. However, they were definitely worth the work! They were a huge hit. Directions: In a 4 qt saucepan combine all ingredients except vanilla. Cook over low heat, stirring occasionally, until sugar is dissolved and butter is melted (20-25 minutes). Contineu cooking without stirring until candy thermometer reaches 248 degrees or a small amount of mixture dropped into ice water forms a firm ball (about 2 hours). Note: Usually I have to go a good bit longer than 2 hours to reach 248. Remove from heat, stir in vanilla, pour into buttered 13x9 pan (I used glass) and cool completely. Cut into small squares. I added various items to each bucket as well as personalized it with a wooden monogram. These are SO cute! I love chocolate covered pretzels...I'll have to give this a try. Maybe a patriotic version for the upcoming holidays? This recipes looks delicious. Thanks for sharing it with us. Come and visit. We have a great panini recipe today. Oh my gosh! These look so good. The packaging is adorable and I'm sure they were quite tasty. I'm now in the mood for some chocolate. Oh dear. What an awesome idea and precious little gifts! Hope you have a Very Special Week End and thank you so much for sharing with Full Plate Thursday. 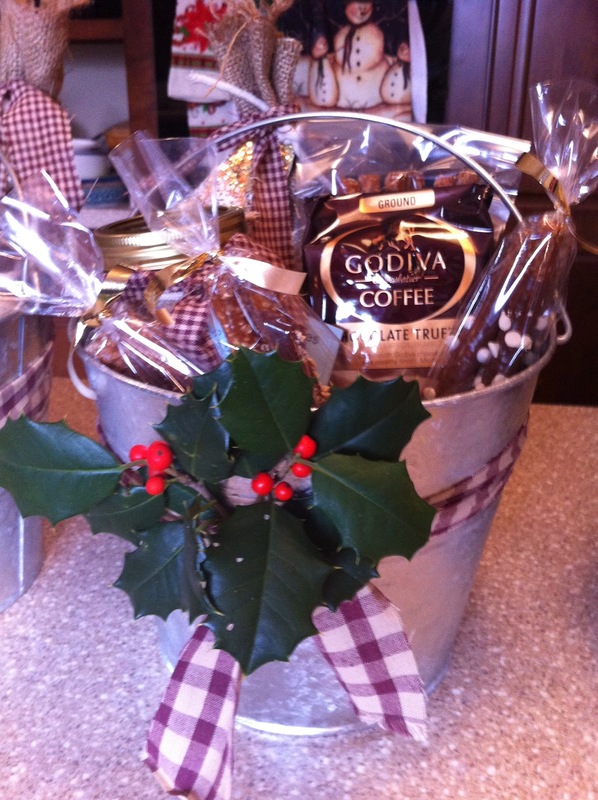 these baskets look fantastic and the goodies look delicious; what a great gift! i make the chocolate covered pretzel sticks too, and before i dip them in the melted chocolate i slice 1/2" pieces of caramel apple wraps (sold in a package in the produce section) and wrap the caramel around the pretzel. the combination of salt, caramel and chocolate is divine!